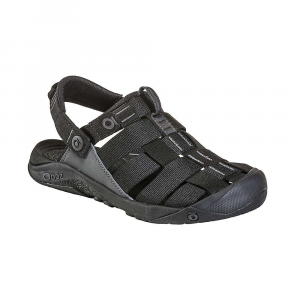 A lightweight slip-on water shoe with strong arch support and a grippy sole. 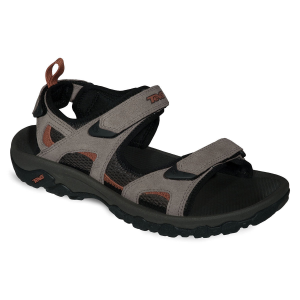 Really good for walking on waterside trails—the polyester webbing’s forgiving feel is nice for walking, and the footbed holds your foot in place. Not ideal for steep sideways walks (eg walking along an angled riverbank). Though this is a fairly close-fitting shoe, I was able to wear them with a thin sock in colder weather. I liked the tilt up heel strap for times when I didn’t want something holding my heel. Has all the makings of a great camp and water shoe. My pair, black and size 11.5, weighed 11 ounces on an electronic scale. 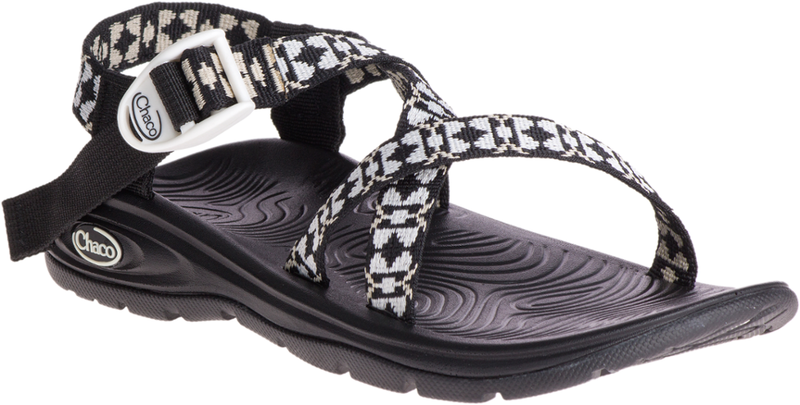 That’s lighter-weight than a pair of Crocs; lighter than my favorite flip-flops from Chaco. Thoroughly soaked after 4.5 miles in the rain and some intentional puddle-jumping. The other immediately notable feature is that, like Crocs, these shoes have no buckles, straps, Velcro, or clips. Just slide your foot in, and should you desire the most secure fit, lift the heel strap up. If you prefer a slip-on, fold the heel strap over. Light pair of wool socks, heel strap down. Note the front grab loop—a little small for a full-size carabiner but perfect for hitching to an S-biner on your backpack. These don't remotely fit like Crocs, however. 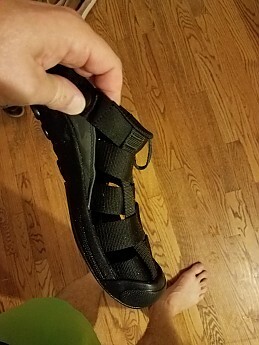 The footbed is built up slightly around the edges to keep your foot seated and in place, and the webbing, as the photos show, doesn't have a lot of extra room. I received these a few months ago and spent quite a bit of time walking on local trails with them. For the first month or so, I wore them with a thin pair of socks. More recently, barefoot. Though I have not worn them while doing water sports yet, I took them on a couple of wet weather day hikes, one a drenching rain that created some deep puddles I intentionally walked in. 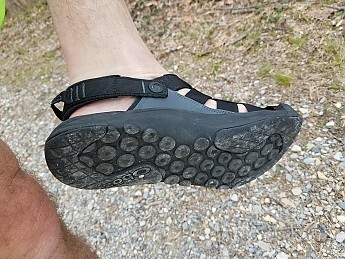 I did not take them out on the more rocky trails because I noted enough shifting side to side, when I walked on a somewhat steep riverbank, that I didn’t feel comfortable using these on steep or angled rocks. 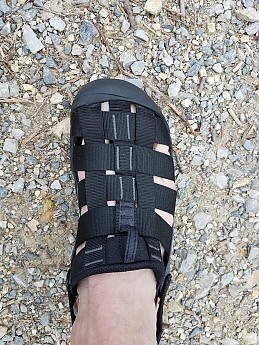 Collectively, and particularly on the nearby dirt/gravel C&O towpath and the dirt, rock and tree root-heavy Seven Locks Trail that parallels a stream near where I live, I have walked about forty miles in these sandals. 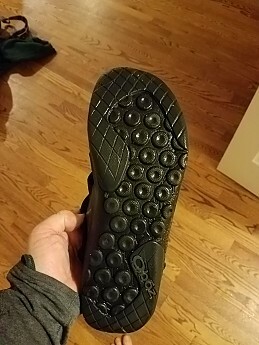 I did manage to wear them in the rain on multiple occasions to get a sense of how the soles work with wet rocks and muddy tracks (I give them 8 out of 10 for wet traction). 1. The webbing is very close-fitting. I found that to be comfortable and was a little surprised I never developed any blisters. 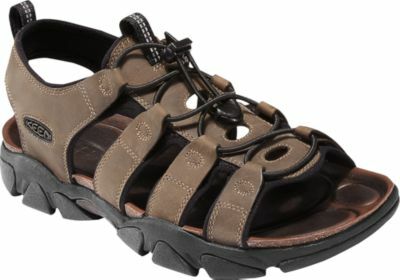 They feel a little tighter, with less air circulation around your feet, than many water shoes or sandals. One advantage is that although there is plenty of space for water to escape, it really limits the amount of goop and grit that gets in. I occasionally had to stop on a wet hike and knock some sand out from under my feet—that's it. 2. The midsole and sole combination is near-excellent. 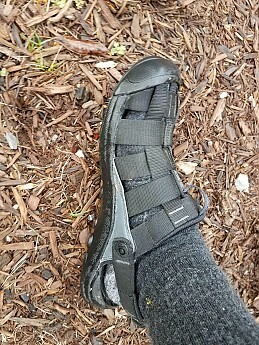 Whether I was walking on a trail or wearing them all day on a Saturday, this is a very comfortable and fairly supportive sandal. It has a high arch, similar to the insoles in Oboz’s boots. I liked it, but I could see some people finding it uncomfortable. The midsole is sufficiently firm and thick to protect you from rocks and roots you might step on, and it’s good to have coverage for your toes. 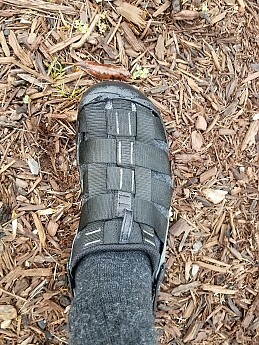 (note the toe bumper is not as thick as what you would find on some Keen shoes, but it’s a lot more protection than any open-toe sandal). 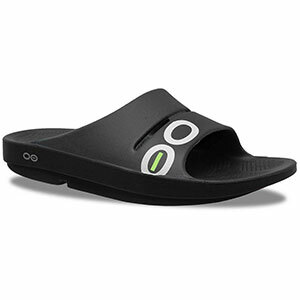 The sandal feels very secure, keeps your foot in place front to back. Side to side, I felt there was a little bit of "play," and this would probably not be my choice for steep angled trails that would benefit from a lot of lateral stability; but, most water sandals don’t have outstanding lateral stability. Note that these are still close-fitting when wet—the webbing doesn't loosen up noticeably. 3. 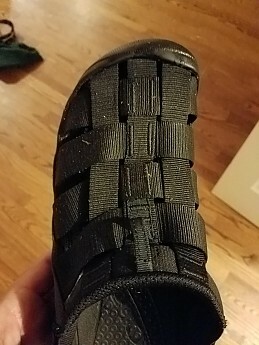 I like that the heel strap can flip out of the way, and the loops on the heel strap or on the front turned out to be a good way to clip these to my pack. 4. On the rainy hikes, I found the traction was very good on wet rocks. Perhaps not quite up to the level of some dedicated pro water sandals that use very sticky "spider" or climbing rubber, but I did not experience any slips or wipe-outs other than an intentionally stomp in a puddle that had a couple of inches of mud underneath...I skidded pretty nicely in the muck. 5. I have found simplicity is best when you’re around water, mud, silt, and grit, so I really like the fact that nothing on this sandal could get fouled up. Because the webbing is open, I expect them to drain well too. 6. 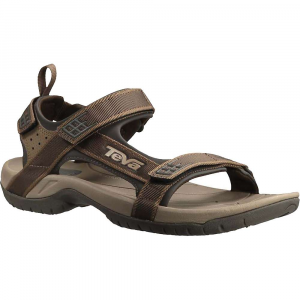 The sandals function well when they are wet, but all that relatively forgiving, soft mesh takes a while to dry. After a particularly drenching evening hike, the mesh was still damp the following morning. 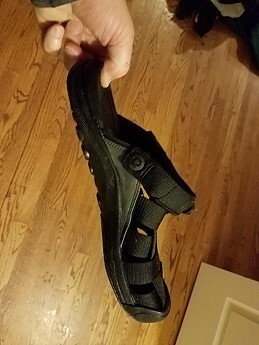 I appreciated the opportunity to test these sandals for the Review Corps. 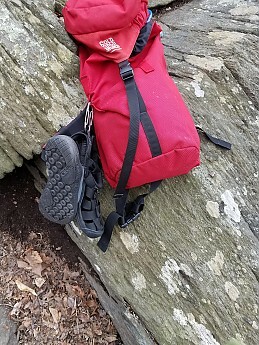 The Oboz Campster is a very good option for river or stream crossings during a backpacking trip, for wearing in camp, and for wearing in and around the water and on lighter/casual hikes. OK for canoeing, horse camping or car camping but too heavy for UL backpacking. Thanks for the review and info, Andrew, just in time for sandal season! I hope you'll let us know how these work out if you do any paddling or other water sports. Thanks! These sure won't win an award for best looking sandal. Thanks for a good review.